The University of California, Los Angeles School of Medicine—known as the David Geffen School of Medicine at UCLA (DGSOM)—is an accredited medical school located in Los Angeles, California, USA. The School was renamed in 2001 in honor of media mogul David Geffen who donated $200 million in unrestricted funds. 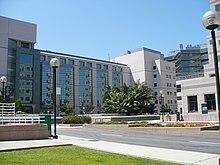 Founded in 1951, it was the second medical school in the UC system, after the UCSF School of Medicine. At its incorporation in 1873, the UCSF School of Medicine was the only medical school in the University of California. The UC Board of Regents voted to establish a medical school affiliated with UCLA in 1945. In 1947, Stafford L. Warren was appointed as the first dean. Dr. Warren had served on the Manhattan Project while on leave from his post at University of Rochester School of Medicine. As the founding dean of the medical school, he proved to be a capable administrator and fundraiser. His choice of core faculty consisted of his former associates at Rochester in Andrew Dowdy as the first professor of radiology, John Lawrence as the first professor of medicine, and Charles Carpenter as the first professor of infectious diseases. Along with William Longmire Jr., a promising 34-year-old surgeon from Johns Hopkins, the group was called the Founding Five. Building of the medical center and the School of Medicine began in 1949. The 1951 charter class consisted of 26 men and 2 women. Initially there were 15 faculty members, although that number had increased to 43 by 1955 when the charter class graduated. The first classes were conducted in the reception lounge of the old Religious Conference Building on Le Conte Avenue. In July 1955, the UCLA Medical Center was opened. Sherman Mellinkoff succeeded Stafford Warren as dean in 1962 and served for the next 24 years. Under Dr. Mellinkoff, the school experienced unprecedented growth. The UCLA Neuropsychiatric Institute, the UCLA Brain Research Institute, and the Marion Davies Children's Center were founded. The Jules Stein Eye Institute and the Reed Neurological Research Center were established as well. By decade's end UCLA had doubled the size of the medical school and the hospital. The UCLA School of Dentistry, School of Public Health, and School of Nursing were formed as well. The medical school grew to nearly 400 medical students, more than 700 interns and residents, and almost 200 Masters and doctorate candidates. A partnership was formed with the Charles R. Drew University of Medicine and Science in 1966 to train medical students with the goal of meeting the needs of the underserved in South Los Angeles. 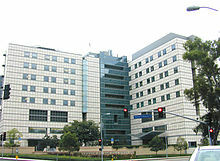 The school continued its growth in the 1970s, becoming affiliated with VA facilities as well as Olive View–UCLA Medical Center. In 1974, the school co-founded the Biomedical Sciences Program with UC Riverside that offers 24 students each year the opportunity to earn both the B.S. and M.D. degrees in seven years instead of the traditional eight. 1981 saw the dedication of the Doris and Louis Factor Health Sciences Building which houses the School of Nursing and Jonsson Comprehensive Cancer Center. In 1987, construction began on UCLA Medical Plaza, an outpatient facility located across the street from the main hospital. Kenneth I. Shine succeeded Sherman Mellinkoff as dean in 1986. In 1992 Dr. Shine left UCLA to become President of the Institute of Medicine in Washington, D.C. Gerald S. Levey was then appointed provost of medical sciences and dean of the medical school in 1994. Dr. Levey oversaw expansion of interdisciplinary research and the establishment of a Department of Human Genetics. Under his leadership the Gonda (Goldschmied) Neuroscience and Genetics Research Center as well as the Ronald Reagan UCLA Medical Center, ranked "Best in the West" by US News & World Report, were constructed. In October 2008, Dr. Levey announced that he would be stepping down from the position of Dean in 2009. Effective February 2010, Dr. A. Eugene Washington was appointed Dean of the UCLA School of Medicine and Vice Chancellor of Health Sciences at UCLA. Dr. Washington, a noted clinician, academician, researcher, and university administrator, was recruited from UCSF, where he served as Vice Chancellor and Provost, as well as Professor of gynecology, epidemiology and health policy. Dr. Washington is the first-ever African-American to hold these leadership posts at UCLA. UCLA constructed the Ronald Reagan UCLA Medical Center across the street from the original facility to comply with the California earthquake law. The 1,050,000-square-foot (98,000 m2) hospital is named after the late President of the United States and Governor of California, Ronald Reagan. It was designed by Pritzker Prize-winning architect I.M. Pei. Patients were transferred there from the existing hospital in June 2008. In the rankings released for 2015, U.S. News & World Report ranked David Geffen School of Medicine at UCLA at No. 12 in the U.S. in research and for 2013-2014 ranked UCLA Medical Center at No. 5. The Geffen School of Medicine has an acceptance rate of 4.5%, rendering it to be one of the most competitive medical schools in the country. The David Geffen School of Medicine at UCLA accepts applications for summer academic enrichment programs. These programs include the Premedical/Predental Enrichment Program (PREP), Summer Medical Dental Education Program (SMDEP), and the Re-Application Post baccalaureate Program (RAP). Application deadlines are March 1 for the PREP and SMDEP programs, while the RAP program has a deadline of May 15. Arie S. Belldegrun, MD, FACS, is a director of the UCLA Institute of Urologic Oncology and is Professor and Chief of Urologic Oncology at the David Geffen School of Medicine. He holds the Roy and Carol Doumani Chair in Urologic Oncology. He is the Clinical Director of the UCLA Prostate Disease Research Program and Surgical Director of the UCLA Kidney Cancer Program. Ronald W. Busuttil, MD, PhD is the Chairman of the Department of Surgery, and Chief of Liver and Pancreatic Transplantation. He established the liver transplant program at UCLA, and is a world-renowned expert in liver transplantation. He was the subject of scandal when it was revealed that he had given Japanese yakuza bosses priority liver transplants in exchange for large donation to the hospital. Selma Calmes, co-founder of the Anesthesia History Association, former vice-chair of the department of anesthesiology. Robert Cameron is Chief of Thoracic Surgery, Director of General Thoracic Surgery, Surgical Director of the Thoracic Oncology Program, and an Assistant Professor of Surgery. Christopher Cooper is a Professor of Medicine and Physiology. He is Medical Director of the UCLA COPD Program and of the Clinical Exercise Physiology Laboratory. He is also Director of the UCLA Exercise Physiology Research Laboratory. Bruce Dobkin, MD is the Director of Neurological Rehabilitation and Editor-in-Chief of the journal Neurorehabilitation and Neural Repair. Patrick Dowling MD, MPH is the Chairman of the Department of Family Medicine at the David Geffen School of Medicine at UCLA. He is the Co-Founder and Co-Director of the UCLA IMG Program (for International medical graduate) and received the title of NHSC Ambassador by the National Health Service Corps. David Fish is a physiatrist and an editor of a popular PM&R handbook, PM&R Pocketpedia. Robert Peter Gale MD, PhD, DSc(hc), FACP, FRSM. Expert in leukaemia therapy and bone marrow transplants. Helped the Soviet Union and Japan governments mitigating the Chernobyl and Fukushima nuclear power faculty accidents. Michael Gottlieb was one of the first physicians to report a case of AIDS taking credit for the ideas of a medical intern, Robert Wolf, who initially raised the question. Frank Apgar, MD was another faculty member and was the ICU attending who initially suggested PCP be worked up in what turned out to be the first identified patient with AIDS at UCLA and asked that the housestaff work up this possibility. Louis Ignarro, 1998 Nobel Prize in Physiology/Medicine. Ira Kurtz is Chief of the Division of Nephrology and head of the Membrane Transporter Research Center. Babak Larian is an Assistant Clinical Professor of Surgery, Otolaryngology. Susan Perlman is a Professor in the Department of Neurology. Michael E. Phelps, PhD, is one of the inventors of the positron emission tomography (PET) scanner, Chairman and Norton Simon Professor of the Department of Molecular and Medical Pharmacology, and Director of the Crump Institute for Molecular Imaging. William G. Plested is a cardiothoracic surgeon and past president of the American Medical Association. Joshua Prager is the president of North American Neuromodulation Society. Arnold B. Scheibel is a professor of Neurobiology and Psychiatry and former Director of the UCLA Brain Research Institute (BRI). Arya Nick Shamie is a professor and Chief of Orthopaedic Spine Surgery and Neurosurgery. President, American College of Spine Surgery. Pioneer in the field of minimally invasive spine surgery and recently named on the list of Top Ten Academic Spine Surgeons in the US. Alcino J. Silva is a Professor of Neurobiology, Psychiatry, and Psychology. Pioneer in the field of molecular and cellular cognition of memory. Ronald H. Stevens is Professor of Microbiology, Immunology, and Molecular Genetics and is Director of the UCLA IMMEX Project. ^ "Neuroscientist named dean of David Geffen School of Medicine at UCLA". UCLA. Retrieved 2016-08-12. ^ "Appointment of A. Eugene Washington as Dean of the David Geffen School of Medicine and Vice Chancellor of Health Sciences at UCLA". evc.ucla.edu. 2010-02-01. Retrieved 2011-12-26. ^ "Best Medical Schools: Research;". U.S. News & World Report. Archived from the original on 2012-04-15. Retrieved 2012-04-19. ^ "UCLA's David Geffen School of Medicine Applications". begincollege.com. Retrieved 2012-01-15. ^ "Dr. Arie Belldegrun - Board of Directors - Teva". tevapharm.com. Retrieved 2013-07-27. ^ "Welcome to Kite Pharma, Inc". kitepharma.com. Retrieved 2013-07-27. ^ "Arie Belldegrun M.D. | David Geffen School of Medicine at UCLA". people.healthsciences.ucla.edu. Retrieved 2013-07-27. ^ "Arie Belldegrun, M.D". usrf.org. Retrieved 2013-07-27. ^ "Japanese gang figures got new livers at UCLA". May 30, 2008. ^ "Selma Calmes". Changing the Face of Medicine. NIH. Retrieved 24 November 2013. ^ "Neurorehabilitation and Neural Repair". Sage Journals. Retrieved 8 November 2012. ^ "UCLA Membrane Transporter Research Center". Retrieved 8 November 2012. ^ "Arya Nick Shamie, MD". UCLA Health Systems. Retrieved 8 November 2012.